Our amenities cater to both business and leisure travellers. As we welcome you into our city, we also rope in our neighbours. Our collaborative efforts with local partners puts you in an ideal spot to seamlessly permeate into the neighbourhood. 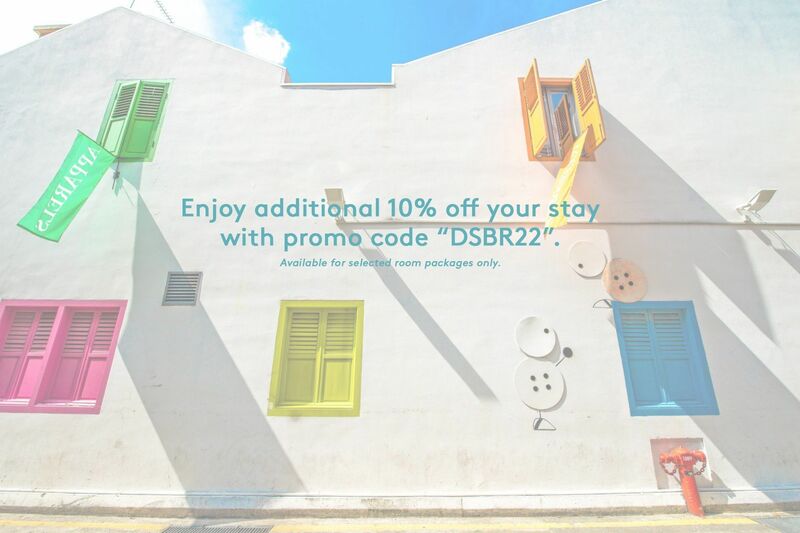 Enjoy an additional 10% off all room rates when you book directly with us via your mobile devices. Exclusive to this website - Up to 25% off with guaranteed late check-out and free unlimited Wi-Fi. Start planning your Singapore getaway and make a resolution to live every day as an adventure! Inclusions: 20% off food and beverage spend (excluding alcohol) Complimentary Wi-Fi Complimentary guaranteed late check-out till 2pm Priority room upgrade Option to amend non-refundable bookings with purchase of “Flexi-Policy” Option to check-in early or check-out late with purchase of supplement You'll also enjoy our Best Rate Guarantee and if you find a valid lower rate within 12 hours of your reservation, we'll match the price and extend a further 15% off. View full details and Terms & Conditions for Book Direct Benefits here.For a list of family-friendly facilities and services, please click here. Included in your weekend stay: Buffet breakfast, 3pm check-out, rooftop pool access, free unlimited Wifi & more! With our Weekend Getaways offer, you can take it easy and enjoy a leisurely breakfast, even squeeze in some extra time by the pool before checking out to your next destination! Book Direct Benefits* Best Rate Guarantee Exclusive Rates Free Wi-Fi Dining Credits Priority Room Upgrade Priority Request Service "Stay Flex" Policy *View full details and Terms & Conditions for Book Direct Benefits here.For a list of family-friendly facilities and services, please click here. Exclusive to this website - Book in advance and get up to 20% off with a host of benefits, including free unlimited Wi-Fi. Up to 20% off our Best Flexible Rate on 45 days advanced bookings – EXCLUSIVE TO THIS SITE Up to 15% off our Best Flexible Rate on 30 days advanced bookings Up to 10% off our Best Flexible Rate on 14 days advanced bookings Book Direct Benefits* Best Rate Guarantee Exclusive Rates Free Wi-Fi Dining Credits Priority Room Upgrade Priority Request Service "Stay Flex" Policy *View full details and Terms & Conditions for Book Direct Benefits here.For a list of family-friendly facilities and services, please click here. The perfect partner for your business travel or as your restful launch pad for exploring the lion city. With 300 fully air-conditioned rooms and different room types, you are catered with options that match your different travel needs. We have kept in-room offerings to a minimal, only providing you with what you need, at a high quality, in the most efficient way possible. No frills, no unnecessary additional charges. Our rooms feature super comfy Hypnos beds, quality linen and cosy duvets to guarantee a good night's rest. Our family rooms accommodate up to 2 adults and 2 children aged 12 or under, while our accessible rooms are specially designed for guests with special needs. We are also happy to assist with any special requests to ensure a comfortable stay. Explore one of the Singapore’s hip and energetic neighbourhood, where character oozes from every alleyway and century-old temples.